Experience the splendor of India’s top architectural monuments, including several UNESCO World Heritage Sites like the Taj Mahal, Humayun’s Tomb and the stunning Fatehpur Sikri. This 8-day private tour with an expert guide gives you insight to Muslim and Hindu cultural influences in the Golden Triangle — Delhi, Agra and Jaipur — plus Pushkar and beyond. See Qutub Minar in bustling Delhi, ride an elephant to Amber Fort, visit the City Palace in Jaipur and admire the Brahma Temple in Pushkar. Breakfast is complimentary, with optional upgrades to include lunch or dinner. Day 01: Delhi Upon your arrival in Delhi, transfer to hotel by private car, . After check-in and lunch, meet your private guide for a half-day sightseeing tour of Delhi. Day 02: Delhi – Agra After breakfast, drive to Agra by private car an approximate four-hour drive. After lunch and check-in at your hotel, enjoy more afternoon sightseeing with your local guide. Day 03: Agra – Jaipur Enjoy breakfast at your hotel, followed by an approximate five-hour drive to Jaipur. En route, visit the UNESCO World Heritage red sandstone complex of Fatehpur Sikri, built in 1569 by Emperor Akbar and abandoned 15 years later due to water scarcity. Take a walk inside the walls of the complex as your guide enlightens you about the Hindu and Muslim architectural style of the sprawling construction, including Jama Masjid, Tomb of Salim Chishti Chisti, Panch Mahal and other buildings. Day 04:Jaipur Your day in Jaipur begins after breakfast with a guided exploration of Amber Fort. Feel like a maharaja from the past as you ride up to Amber Fort on an elephant outfitted with traditional Indian draperies! As you walk around the hilltop palace, constructed at the end of 16th century, learn about this excellent example of Rajput architecture from your guide. Admire breathtaking views of Maota Lake from the fortress as well as the palace’s ornate design and unique architectural elements. After lunch, enjoy an afternoon city tour of Jaipur, whose origins can be traced back to the 18th century during the reign of Jai Singh II. Prepare to look beyond the bustling metropolis to find its historical charm, such as the magnificent palaces, temples, lush gardens and pink plastered stone that gives Jaipur the popular name “Pink City.” Your guide will take you to visit the top sights of Jaipur, starting with the City Palace with its fine collection of textiles, costumes and armor. Then, admire the exquisite Hawa Mahal, or Palace of the Winds, built to resemble the crown of the Hindu god, Krishna. Last, see Jantar Mantar, the extraordinary stargazing observatory built by the renowned astronomer, Maharaja Jai Singh, before heading back to your hotel. Day 05: Jaipur – Pushkar After breakfast at your hotel, embark on a three-hour drive to Pushkar and check in at your hotel. After lunch, take a journey to nearby Ajmer with your guide. 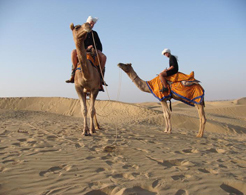 Day 06: Pushkar – Delhi Explore Lake Manasorovar in the morning and drive to Darchen which is 1 hour drive and, 4,560 m in elevation and over night in camp / G house. Day 07: DARCHEN – DIRAPUK: After early morning breakfast trek starts (The Kora begins) and after 5 – 6 hours trek to Dirapuk, 4,890 m in elevation and overnight in camp.